Earlier this month, another for-profit college chain closed abruptly, leaving more than 20,000 students and 4,000 GI Bill beneficiaries wondering why this happened and how this will affect their future educational endeavors. 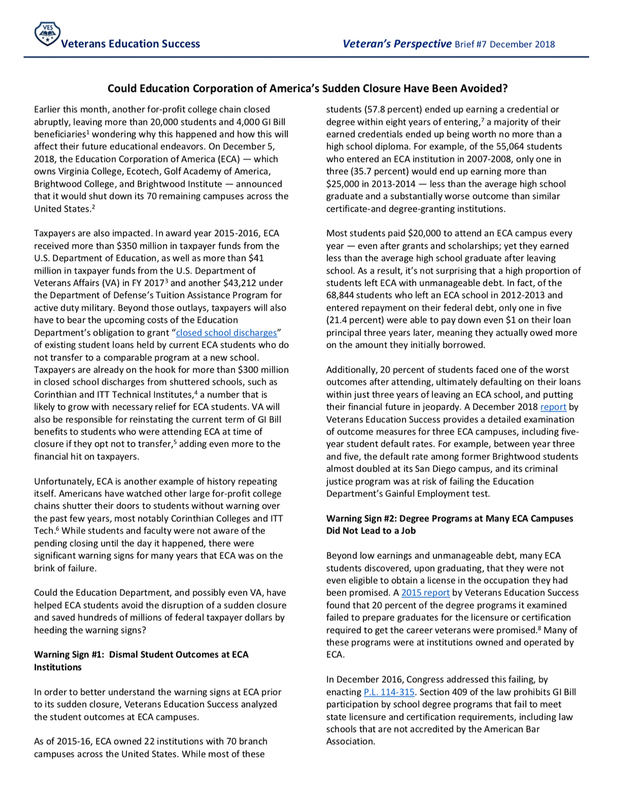 On December 5, 2018, the Education Corporation of America (ECA) — which owns Virginia College, Ecotech, Golf Academy of America, Brightwood College, and Brightwood Institute — announced that it would shut down its 70 remaining campuses across the United States. Could the Education Department, and possibly even VA, have helped ECA students avoid the disruption of a sudden closure and saved hundreds of millions of federal taxpayer dollars by heeding the warning signs?